John O’Groats is a popular place to leave. Most people, from charity walkers to place-name collectors, leave the British mainland’s most northerly town as soon as they get there. Usually they’re off towards Lands End, Britain’s most southerly point. So was it just perversity that saw me joining a small passenger ferry going in the opposite direction? I like to think it had more to do with the allure of the low-lying group of islands just visible to the north of John O’Groats. Orkney – as this archipelago is collectively called – is next stop north of the Scottish mainland. Although you can fly there, part of the adventure is to arrive by boat. After all the seas were once the highways, and coasts and islands the crossroads of the old world. What we now see as outposts were once closer to the ebb and flow of civilization. Nowhere does this feel more true than in the history-saturated Orkney Islands. Recent history hits you first. After arriving at the port of Burwick, we travelled north from island to island across the Churchill Barriers – a series of causeways built during World War 2 to connect some of the Orkney islands. Much of the work was done by prisoners of war, especially Italians. On the tiny island of Lambholm they have left behind a remarkable reminder of their stay: The Italian Chapel. This comprises two Nissen huts joined together into a small but amazingly intricate church, complete with statues, altar furniture and ceiling decorations reminiscent of the Cistine Chapel. The Italian prisoners, some of whom had been craftsmen in their native country, did all the work in their spare time. Wonders of a greater scale and age are not far away on Orkney Mainland, the main island. Stone is the theme, with remains of civilizations dating back 5 000 years and more to be found all over the island. The Stones of Stenness, the Ring of Brodgar and other lesser-known sets of standing stones are set quietly amid the on-going agricultural activities of today’s Orcadians (as Orkney islanders are called). Despite the setting – or perhaps because of it – the stones still resonate with a mystery that is added to by our ignorance of their purpose. There may be slightly less mystery about Skara Brae, but its presence is still stunningly powerful. 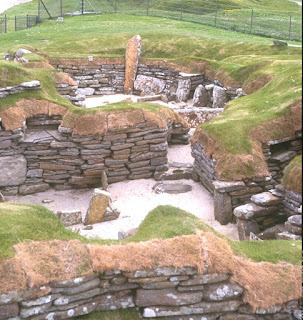 Literally a stone village from the stone age, Skara Brae’s huts lay buried beneath the sand dunes of Skaill Bay until a storm uncovered them in the mid 19th century – nearly 5 000 years after their construction. As we wandered among the roofless huts, we were struck by how aptly named the stone age was. Everything in these huts seemed to be made of stone: with stone beds, stone dressers, stone tables, stone fireplaces and even stone water basins still there to be seen. Skara Brae has a modern visitor centre, which is both well appointed and unobtrusive, sitting more than 100 metres from the village proper. And by including a fully-roofed reconstruction of a stone age house, Historic Scotland, who manage the site, have helped the visitor to make more sense of the remains. They have also taken advantage of the distance from the Centre to the village by turning it into a “time walk”. Significant dates from the present day right back to 5 000 Before Present are marked on track-side signs. As you walk back through time, passing the date of Christ’s birth; passing even the date of the construction of the pyramids, you gain a very strong sense of the antiquity of this village. Of course there’s more to the islands than history. Even on the ferry trip across the Pentland Firth to Orkney we’d seen large numbers of sea birds, including puffins and razor bills. Not to be outdone by the birds, grey seals and dolphins had also shown themselves. Later I was even dive-bombed by breeding skuas on Orkney’s only mountainous island, Hoy. I’d gone there to see the famous coastal rock stack known as the Old Man of Hoy. 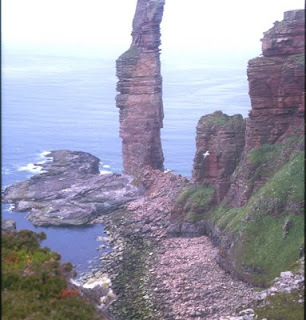 An hour’s walk from the remote and tiny settlement of Rackwick, the stack was first climbed in the late 1960s – an event of such drama that it was broadcast live by the BBC. Today its ochre coloured sandstone slowly crumbles into the sea, though sea birds and climbers still vie for footholds. Orcadian writer George Mackay Brown was a frequent visitor to the island of Hoy, and he wrote beatifully about a visit to Rackwick towards the end of his life. That Sunday, the beauty of Rackwick struck me like a blow. Once it had been a populous valley, but already it was drained of most of its people. Many of the little croft-houses were derelict; decay was beginning to eat into others - the roof flags were slipping, doors hung on rusty hinges. Slow fires of rust were devouring the pots inside and the iron ploughs at the gable-ends. It seemed a melancholy place, threatened with imminent,utter desolation. - from “For the Islands I Sing”, (John Murray, 1997) pp. 81-82. Mackay Brown lived in the town of Stromness on Orkney Mainland most of his life, and wrote tellingly of the many layers of life there. His stories and poems often wove together that blend of Scots and Norse that make Orkney stand apart. 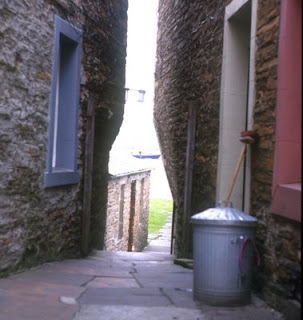 Stromness remains a town of great character, with solid stone buildings and narrow cobbled lanes that almost drop straight into the sheltered harbour. Yet it is no museum town - the locals are as likely to offer you a latte or sell you on-line services as to talk about the old days. The same forward-looking approach is true of Kirkwall, the capital and main town of Orkney. This 1000 year old town, founded by vikings, centres on the imposing Cathedral of St Magnus. Kirkwall hosts an extraordinary event every Christmas Day and New Years Day. Called “The Ba’”, it involves hordes of local townsmen running through the streets disputing possession of a cork-filled leather sphere (known as the ba’). The ancient game, whose grizzly origins seem to have involved the head of a defeated enemy invader being kicked around the town, is played between the “Uppies” and the “Doonies” (men from either side of town) whose aim is to get the ba’ to the other end of town and score a “goal”. Despite the fierceness of such customs, today’s “invaders” will find that Kirkwall warmly welcomes visitors. The town offers all the modern comforts – on a modest scale – without compromising its obvious pride in a long and different history. Much of Orkney’s difference has to do with its viking heritage. Given that the people spoke a Norse dialect for nearly 1000 years (up to the 1700s) that shouldn’t come as a surprise. You get the definite impression that its people are Orcadian first, and then it’s a toss-up whether their next attachment is to Scots or Norse heritage. Tasmanians often remind mainland Australians that some of the best kept secrets are to be found on off-shore islands. My visit to Orkney convinced me that same is true in the British Isles.